Check out my other resources at: www.tes.com/teaching-resources/shop/mr_science Designed for the new specification AQA GCSE course (Spec point 4.5.1.2) but can be modified for other exam boards. 11 slides covering Contact and non-contact forces. 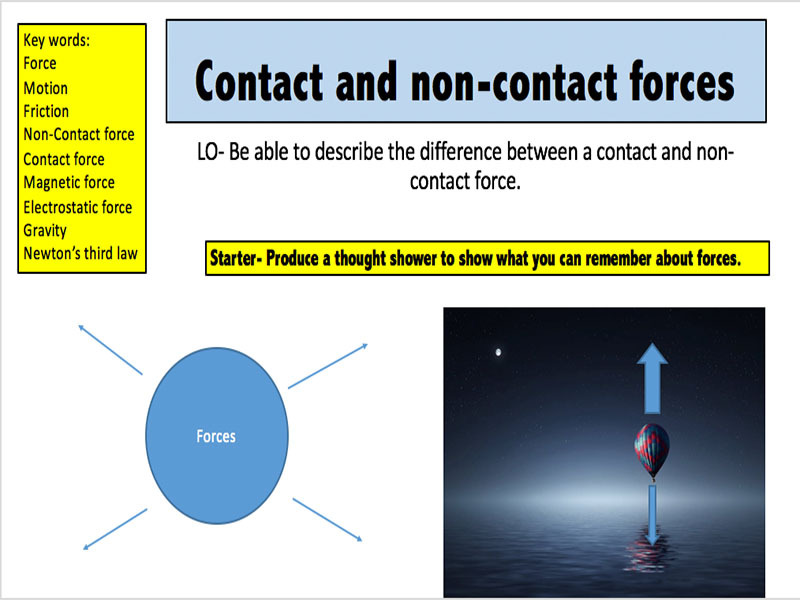 By the end of the powerpoint students would have covered: -Define what forces are -State the units for forces -Be able to explain the differences between contact and non-contact forces. Check out my other resources at: www.tes.com/teaching-resources/shop/mr_science Designed for the new specification AQA GCSE( covers spec point 4.1.3.1 ) course but can be modified for other exam boards. 13 slides covering Exchange surfaces. 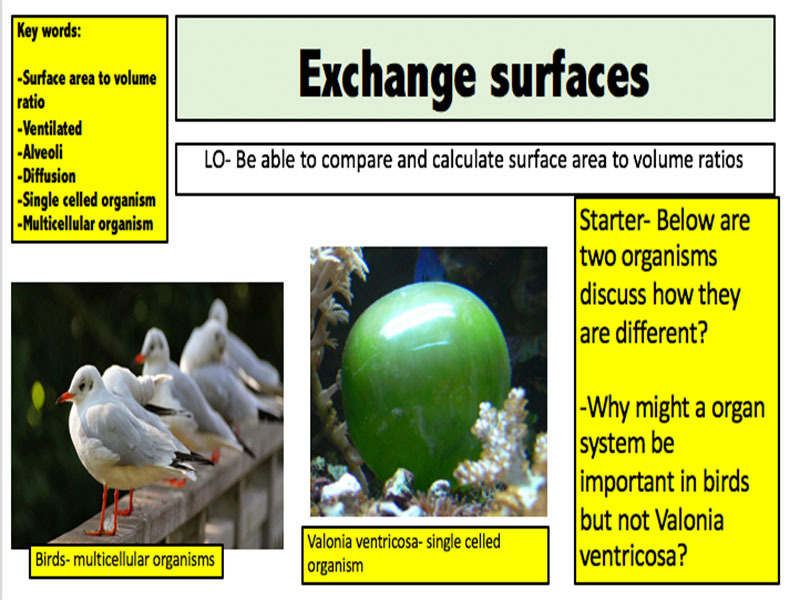 By the end of the powerpoint students would have covered: -Why do plants and animals need to have exchange surfaces -Define the term surface area to volume ratio -How does the surface area to volume ratio change as the organism gets larger. -Includes a practical. 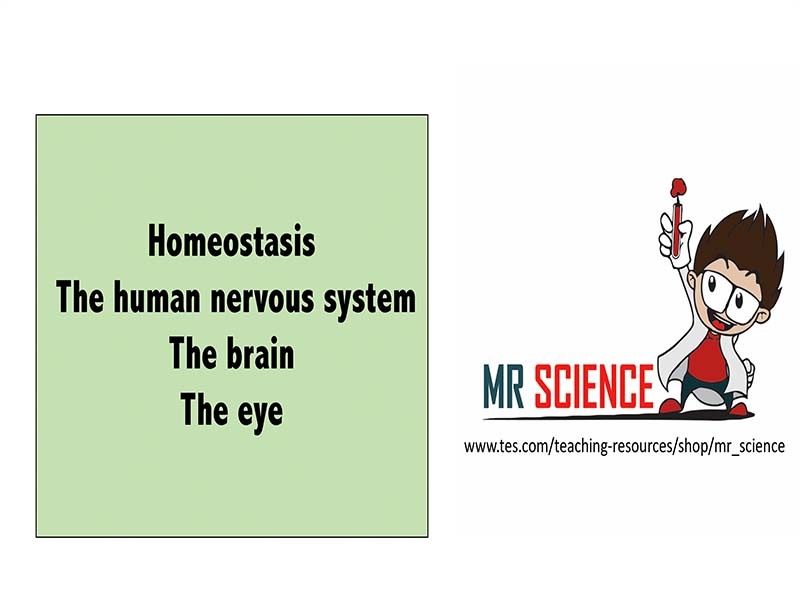 Check out my other resources at www.tes.com/teaching-resources/shop/mr_science Contains 4 lessons covering: Homeostasis The human nervous system The brain The eye Lessons are designed for the new AQA course covering specification points: 4.5.1, 4.5.2.1,4.5.2.2,4.5.2.3 These lessons can be adapted to be used with other exam boards as all new science specifications now cover the same content. 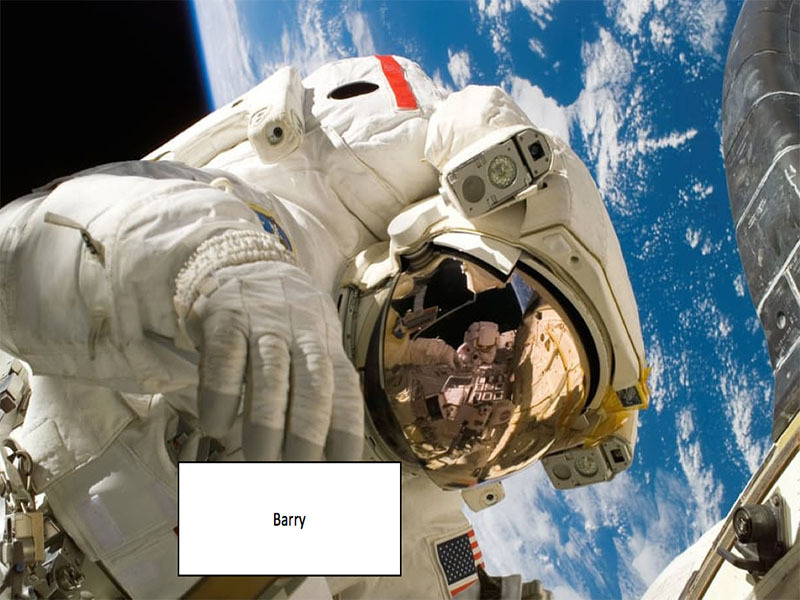 Put all your students names into the different slides, click slide show and the powerpoint will go through all the names and you can randomly stop the slide show to pick a student to ask a question. Press the left arrow to stop and right arrow to start again. Check out my Biology worksheet bundle to save: www.tes.com/teaching-resource/gcse-biology-revision-worksheets-11508210 A great activity that can be used as a starter or plenary to test student recall. Check out my other resources at: www.tes.com/teaching-resources/shop/mr_science Designed for the new specification AQA GCSE(Spec point 4.5.1.1) course but can be modified for other exam boards. 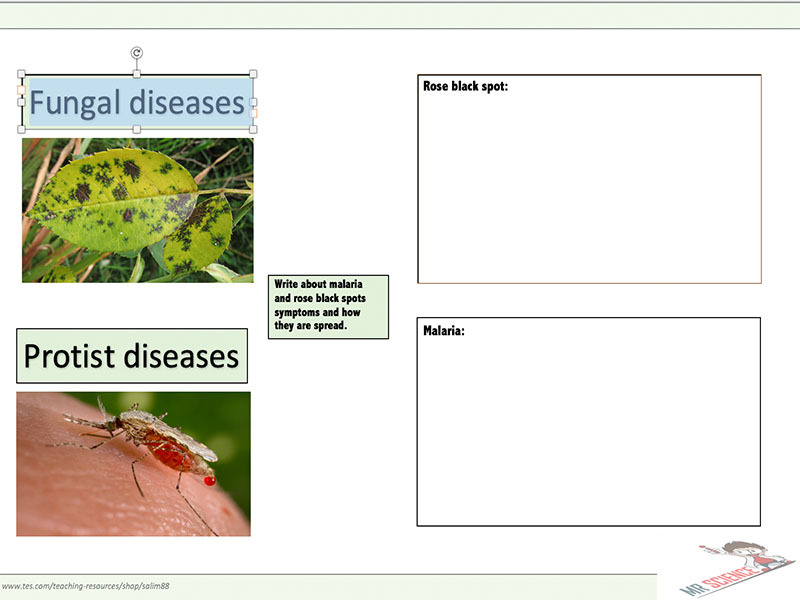 16 slides covering Plant specialisation. 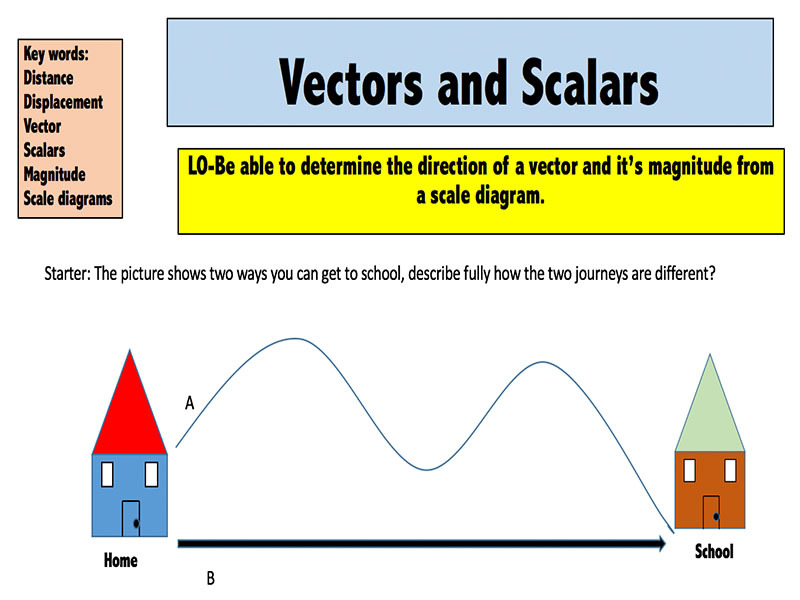 By the end of the powerpoint students would have covered: -Define the key words, vector, displacement and scalar; -Be able to represent Vector quantities; -Determine the direction of a vector and magnitude from a scale diagram. Check out my other resources at www.tes.com/teaching-resources/shop/mr_science Designed for the new specification AQA GCSE course (covers spec point 4.1.1.3) but can be modified for other exam boards. 13 slides covering Plant specialisation. 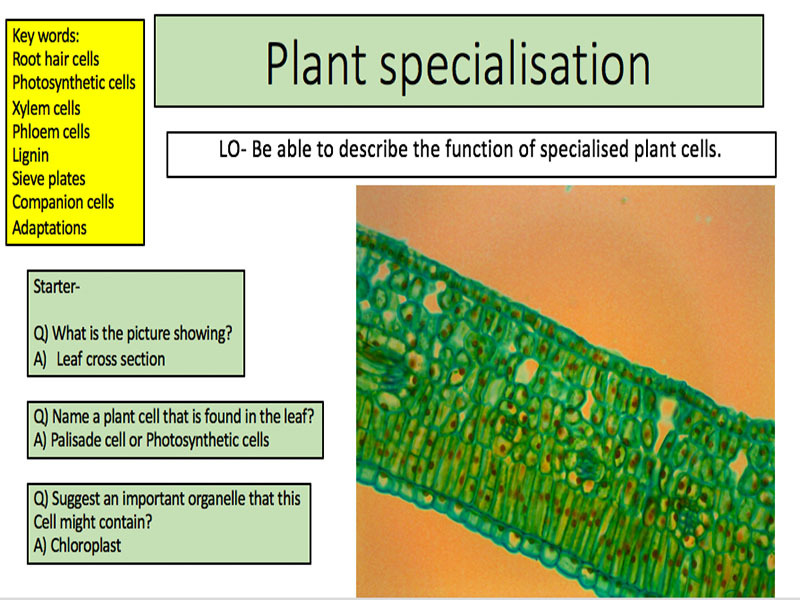 By the end of the powerpoint students would have covered: -Describe how specialised cells in a plant carry out a particular function -Identify different parts of specialised plant cells and relate these identified parts to their function. -Updated-28/05/18 with additional activities Check out my other resources at: www.mrscience.co.uk Designed for the new specification AQA GCSE(cover spec point 4.1.1) course but can be modified for other exam boards. 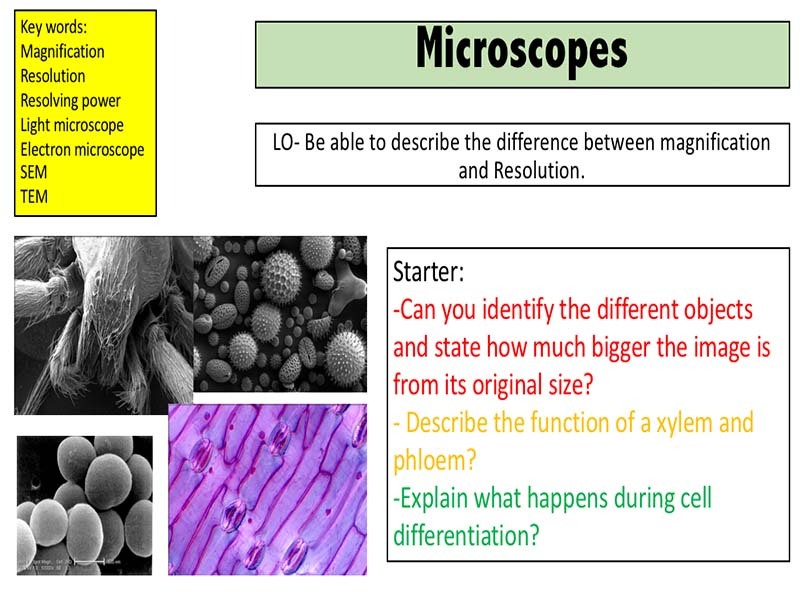 22 slides covering the topic of microscopes. By the end of the powerpoint students would have covered: -Understand that microscopy has developed over time -State the difference between electron and light microscopes -Be able to calculate magnification, real size and image size of a specimen Includes details of a practical looking at Banana cells which is optional. 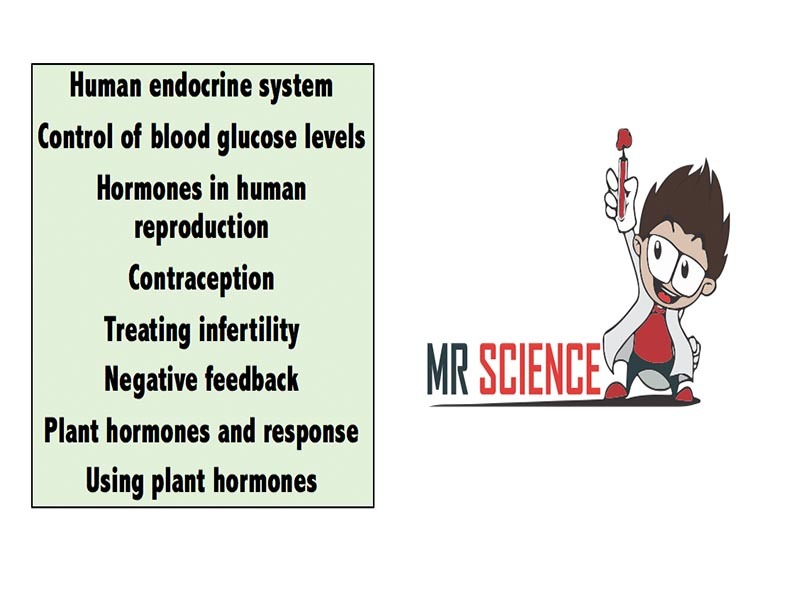 Check out my other resources at www.tes.com/teaching-resources/shop/mr_science Contains 8 lessons covering: Human endocrine system Control of blood glucose levels Hormones in human reproduction Contraception Treating infertility Negative feedback Plant hormones and response Using plant hormones Lessons are designed for the new AQA course covering specification points: 4.5.3.1, 4.5.3.2, 4.5.3.4, 4.5.3.5, 4.5.3.6, 4.5.3.7, 4.5.4.1 and 4.5.4.2 These lessons can be adapted to be used with other exam boards as all new science specifications now cover the same content. Check out my other resources at: www.tes.com/teaching-resources/shop/mr_science Designed for the new specification AQA GCSE( covers spec point 4.5.4.2) course but can be modified for other exam boards. 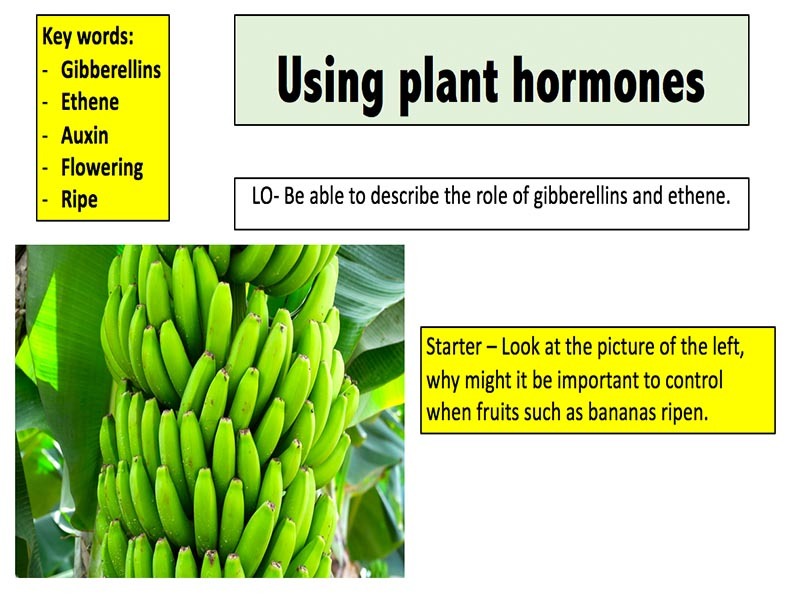 11 slides covering Using plant hormones: -State the hormones used in agriculture and horticulture; -Describe how these hormones can be used; -Observe and evaluate the effects of plant hormones. 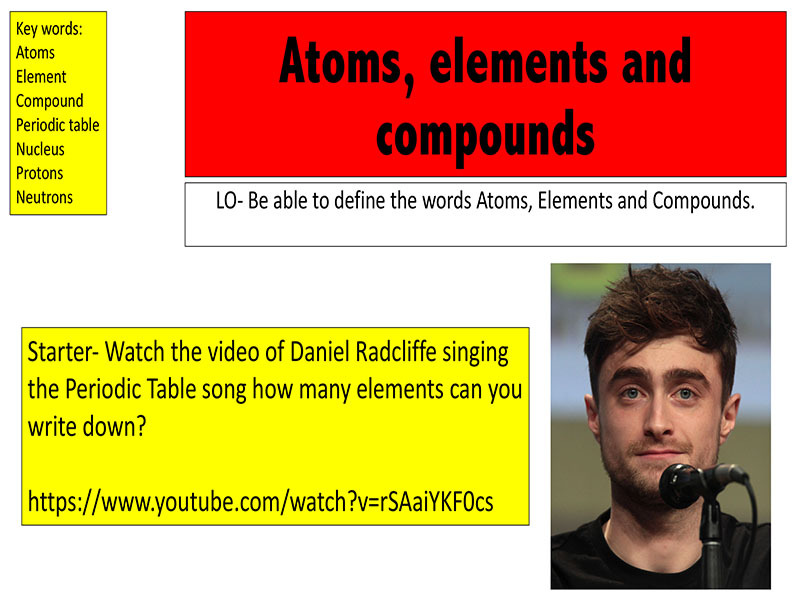 Updated- 27/05/18 Check out my other resources at: www.mrscience.co.uk Designed for the new specification AQA GCSE( covers spec point 4.4.2.1 ) course but can be modified for other exam boards. 21 slides covering Aerobic respiration. 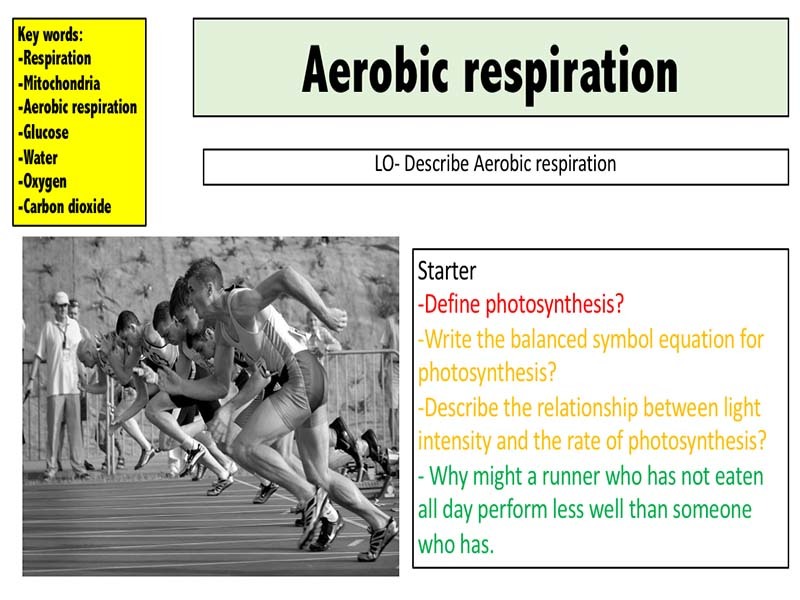 By the end of the powerpoint students would have covered: -Write the word and symbol equation for aerobic respiration -Describe where Aerobic respiration occurs -Explain how you can test for the presence of the products from respiration. Updated Check out my other resources at: www.tes.com/teaching-resources/shop/mr_science Designed for the new specification AQA GCSE( covers spec point 4.3.2.1 and 4.3.2.2 ) course but can be modified for other exam boards. 16 slides covering Monoclonal antibodies. 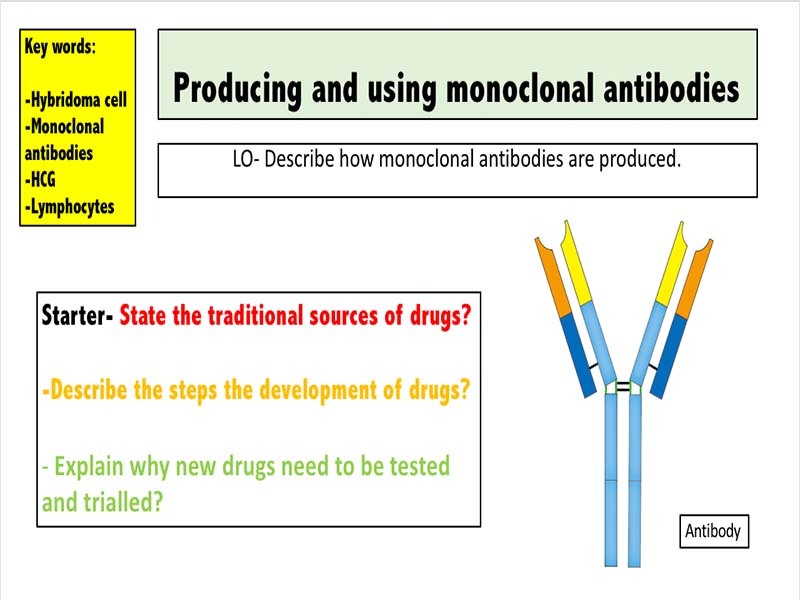 By the end of the powerpoint students would have covered: -Outline the procedures used to produce monoclonal antibodies. -Describe 4 uses of monoclonal antibodies. -Explain why monoclonal antibodies are not yet as widely used. -Consider the advantages and disadvantages of monoclonal antibodies. Powerpoint also includes an activity on the chimera embryos which was recently in the news. 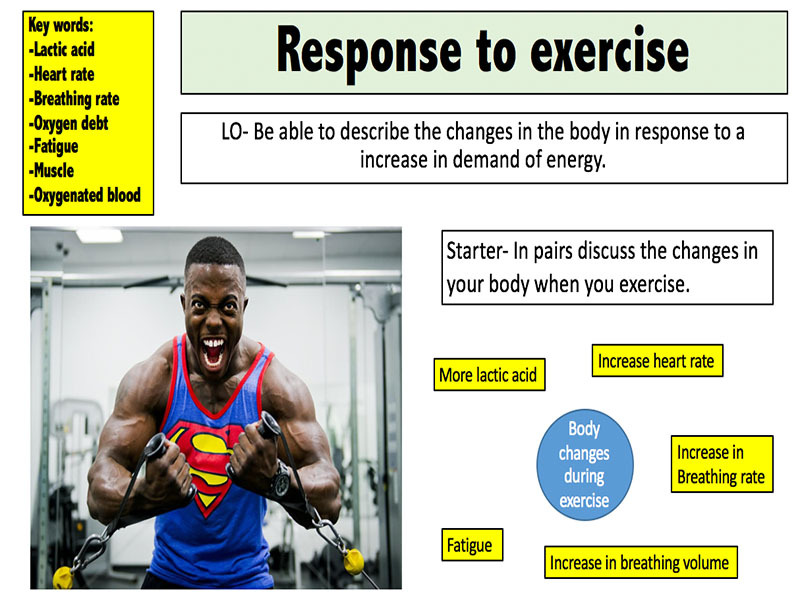 Check out my other resources at: www.tes.com/teaching-resources/shop/mr_science Designed for the new specification AQA GCSE( covers spec point 4.5.3.6 ) course but can be modified for other exam boards. 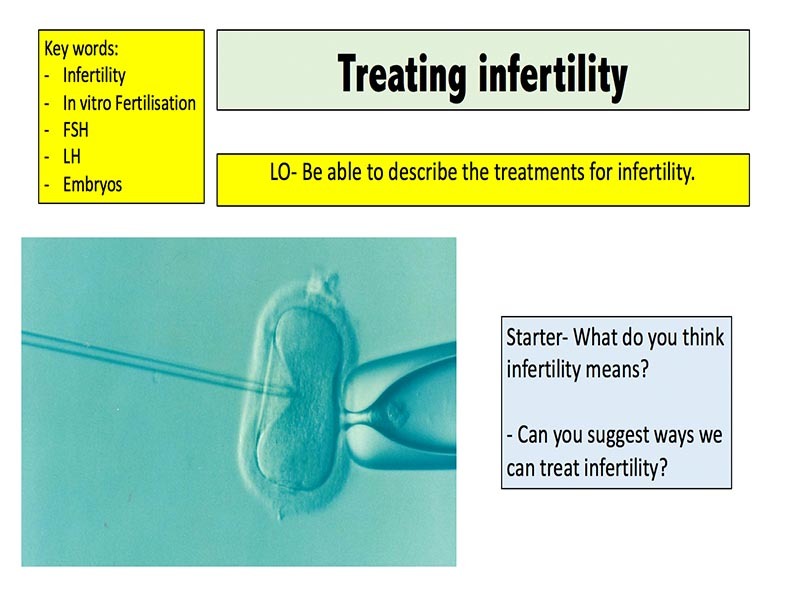 12 slides covering Treating infertility: Describe what is meant by infertility and suggest reasons for it. Describe the steps used in IVF Describe how FSH and IVF can be used to help treat infertility Evaluate from the perspective of patients and doctors the methods of treating infertility. Check out my other resources at: www.tes.com/teaching-resources/shop/mr_science Designed for the new specification AQA GCSE( covers spec point 4.1.3.2) course but can be modified for other exam boards. 11 slides covering Osmosis . 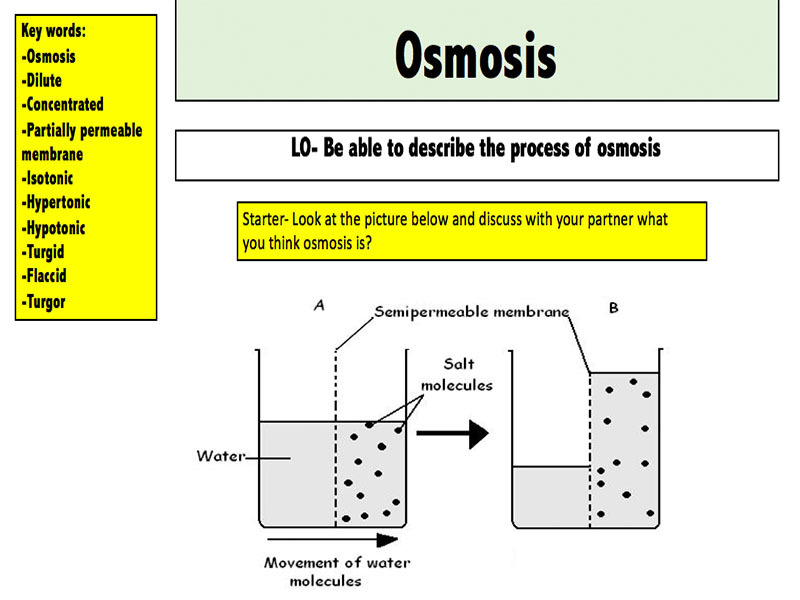 By the end of the powerpoint students would have covered: -Define osmosis -Be able to, draw and interpret diagrams that model osmosis -Investigate the effect of a range of concentrations of salt or sugar solutions on the mass of plant tissue.